Hello...here is my daily painting for tonight. It's a little larger than I usually offer, but I had this canvas and wanted to paint it. It's just one huge sunflower, peaceful in all its glory. Purchase information is below. I am also working on my challenge painting this evening. 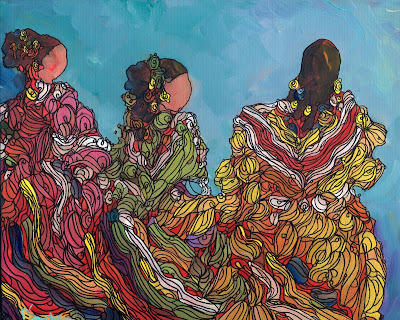 It is three dancers, similar to the two larger paintings I'm working on. I will post it as soon as it's finished. Bosque del Apache was so beautiful. I have pics as well as a couple of videos, I just haven't had time to post them. I'm going back in the spring because if it's so gorgeous now, I can only imagine what it looks like then! Also check out my 150 Challenge blog later tonight and see paintings #129 and #128! 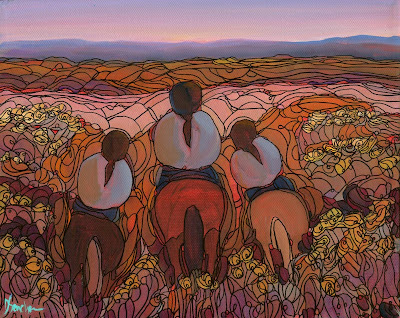 My second Canyon Women painting this year - these are three riders enjoying the chamisa, the mesa, and the last glow of the day. The horses are probably enjoying it too! This will be the daily painting I post as a finished piece tomorrow. 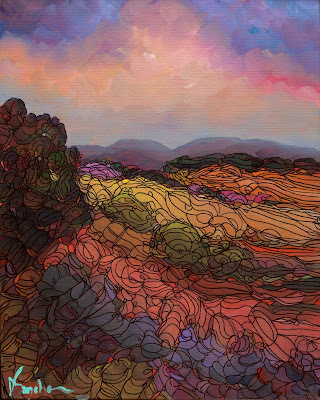 This adobe is from a photo of a house and road near where we stayed in Taos by Blueberry Hill. I think it was early October and the chamisa was beautiful. I don't know what the red/orange bushes are, but they were an explosion of color. I will post purchase information tomorrow. 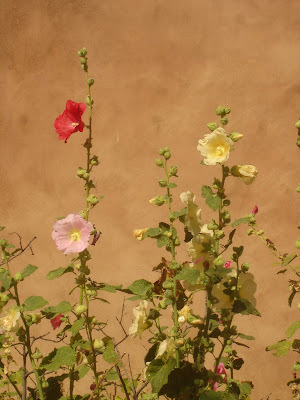 Also check out the hollyhock painting (#131) of my 150 Challenge blog: www.150challenge.blogspot.com Good night! I will post this work as a finished piece tonight. I will also have another daily painting and two challenge paintings ready for posting. 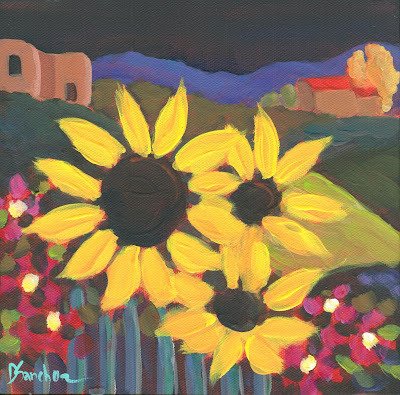 This composition was one of the very first sunflower paintings I did, and actually started me on the road to my career. 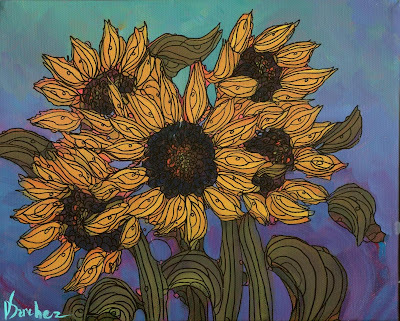 I always try to have at least one of these "fenceline" sunflower pieces at each show. I was going to have it finished last night, but I went to the gym, made enchiladas for my mother-in-law, and made cookies with my cousin to give to the auto mechanic guys who fixed her car and didn't charge her a penny. Good morning! Yesterday I went down to the river to take some photos of the Sandias, but there was too much cloud cover over the mountains. 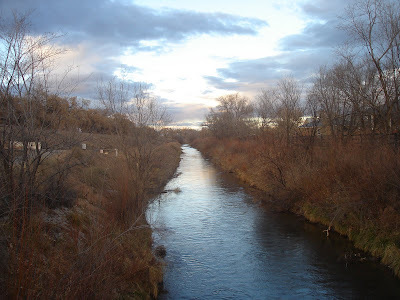 Instead I got this beautiful shot of the acequia. It's about three minutes from my house. The actual river. The Sandias are off on the right, out of range. The river was beautiful. I think the red in the background is willow. These two will probably become paintings. I didn't have the time or the energy for a daily painting today, but I thought you might want to see painting #133 of my 150 Challenge blog. I hope to post a daily painting later this evening. my grandmother raised them and collected them! I remember going to Juaraz with her when I was a little girl and they had tables and tables filled with ceramic chickens - the kind that have a bottom that holds something (like candy or potpourri). She had a corner cabinet filled with them. I have no idea what happened to them. So guess what I have in my studio? 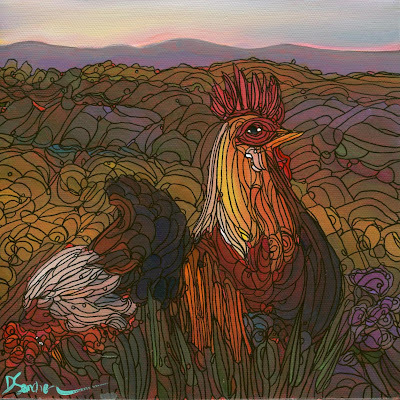 A rooster on a pedestal! And on my wood stove in the kitchen? Two ceramic chickens! So, this is the first of many! I love my watcher, he's definitely a lover, not a fighter! 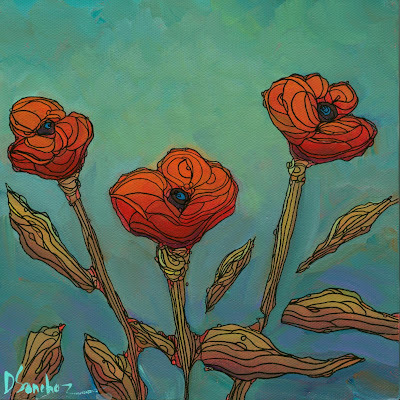 Check out painting #135 on Dee's 150 Challenge blogsite. A similar daily painting will be posted and available for purchase today. This girl has definitely got the swirl down! 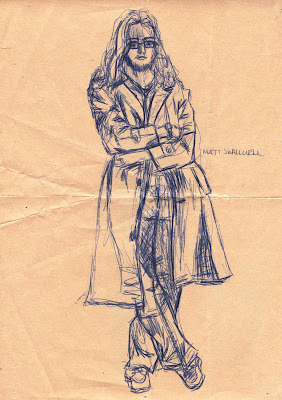 When I sketched it, it looked a little strange, but it's exactly like the photo I took at a performance at the New Mexico fairgrounds last year. Of course, I invented the background. She was performing on concrete underneath a metal roof. I think this background makes it much more interesting. 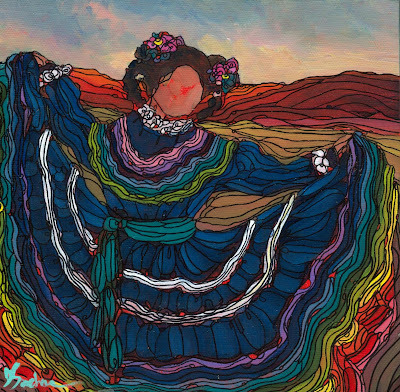 Also, please check out painting #136, "TAOS MOONRISE" at www.150challenge.blogspot.com! I apologize for taking so long to get back into the swing of things, but I'm back on track. My dad is feeling much better now, thanks to all of you who inquired. I should catch up my 150 CHALLENGE paintings tomorrow. 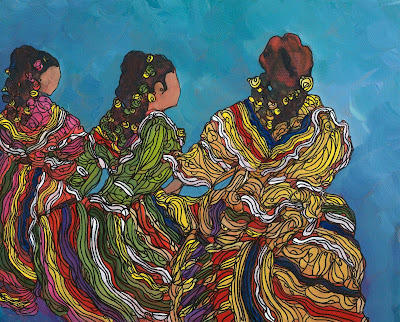 This painting is a request for the three dancers that I so love painting. That's because I spent yesterday evening and this morning at the emergency room with my dad. He had the stomach flu and was very dehydrated. I got home about 2:30am this morning, went to sleep, got up late, and am just now starting to work in the studio. My dad is doing much better, thank goodness. I may have to break for a nap late this afternoon. 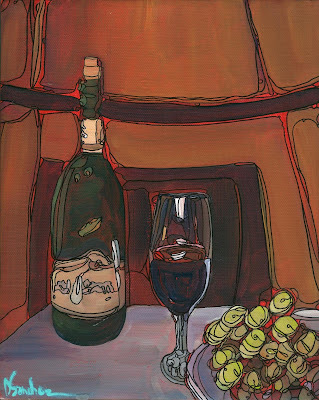 I think this is my first still life, other than a vase of flowers. I've had this photo that I took at a hotel in Santa Fe for some time now, but just never got around to painting my rendition of it. 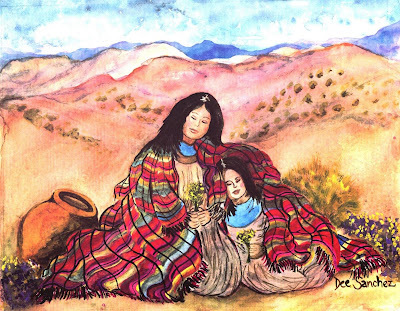 I think it has a whimsical feel and looks like a nice, relaxing way to spend a New Mexico evening! Also, check out tonight's 150 Challenge painting! 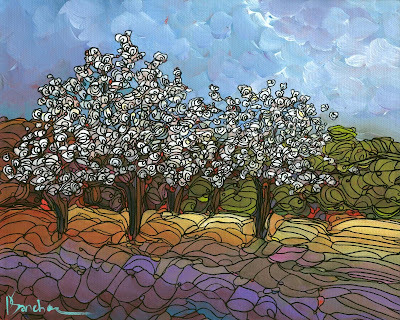 Also, to view the 150 CHALLENGE paintings, click on the link below. I was thinking no lines, now I'm thinking minimal lines. What do you think? It's not varnished and it doesn't have much highlights or shadows yet, so it looks a little dull right now. I do love those rolling hills and the softness of it. Today was fun! I left the house and drove the slow way through Bernalillo, then headed east to Placitas. I pulled into the Loop Road and there were about six cars but I didn't see anyone. I'd painted here before so I just drove slowly down the little dirt road. It winds all the way up to the mountains (which still had snow on them). I found a couple of places and parked. It was windy so I actually painted most of the time in my car. It was so peaceful and quiet. I loved it. 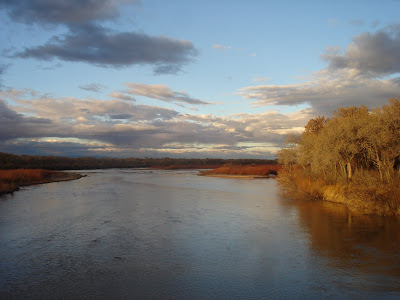 The river in Pilar is breathtaking. Pilar is the little village off on the left on the way to Taos. I had passed by it for years, not even knowing what was behind the little gas station, fruit stand, convenience store, etc. There are picnic grounds and it's just so quiet and peaceful. 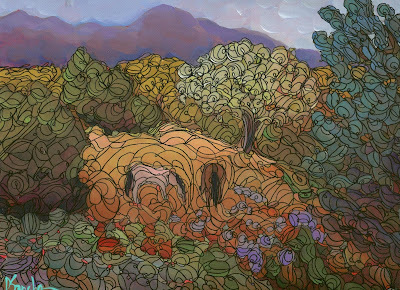 Also, check out www.150challenge.blogspot.com to see tonight's painting! My very first dancer of the new year. 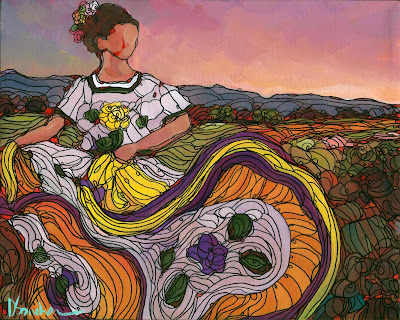 I think I'm more intrigued with the background than the senorita - I love the setting sun and "end of the day" feel. Just very rich and colorful. She seems contemplative, like she's thinking about someone, maybe her novio! 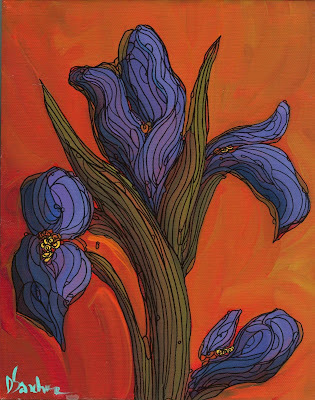 If you've seen tonight's 150 CHALLENGE painting, you'll know I was in the mood to paint this iris tonight. The background is so intense and the iris so calm and beautiful - I love it. I'm having a blast getting back to my daily paintings and I'm loving the 150 CHALLENGE (www.150challenge.blogspot.com). 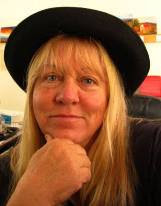 I am working on a large painting now and should have pics tomorrow. One of my old friends emailed me with thorough list of subjects to paint - it really inspired me. I hope I can get through all of them! Wow, I can't believe it's already Friday. Time is passing way too quickly. 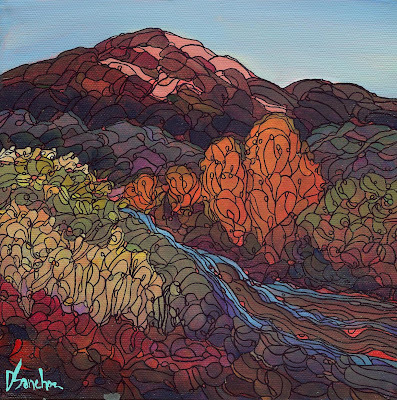 Last night's painting, "Taos Autumn" has been sold. I enjoyed painting it so much that I may try another version for tonight's post. If anyone wants first dibs, email me. I have also wanted to start a large painting for the gallery but couldn't decide what I wanted to paint. Now I know: a large version of Taos Autumn. So I will be working on that today and will take pics of the process. The 150 CHALLENGE is going well. I am enjoying it and have so many ideas I want to try. I have added dragonflies, lightening, and lilly ponds to my list. I don't know how "New Mexico" those are, but we'll find out! I am also trying to think of some cool ways to publicize what I'm doing so people will want to watch and come to the show to see them all in one huge grouping. 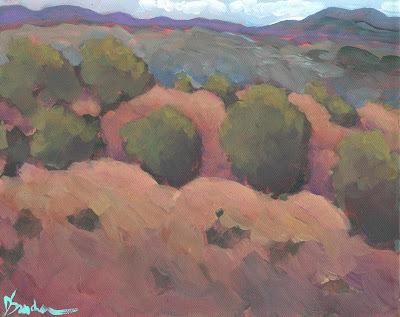 I'm also going on a paint-out this Monday to Bosque del Apache, a huge wildlife refuge about 1 hour or so south of here. I may not paint (I'm taking my supplies, tho), but I'm taking my camera and a picnic. I am trying to fit time in to just relax and enjoy life this year. Anyway, I just wanted to check in with everyone and say thanks for watching, commenting, and supporting my art. Have a happy day. I think this one is rich and vibrant and turned out nicely. Someone asked me to paint some water, so that was on my mind I guess. 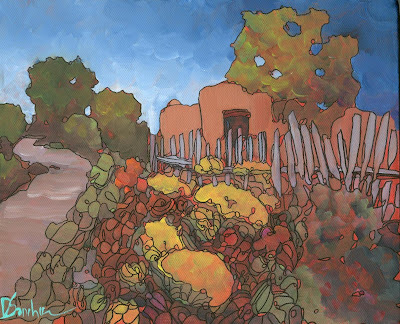 This painting makes me want to be in Taos in October. 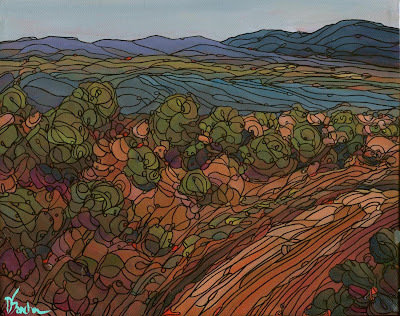 There are so many colors then; the rich reds of bushes, the golden aspens, the running water. I'm happy...Purchase information is below. And check out the link below for the 150 challenge blogsite. I'm posting # 147 tonight! The background in this painting reminds me of being underwater; mysterious and floating. The poppies seems to be reaching, towards the light or the surface. I love this one. 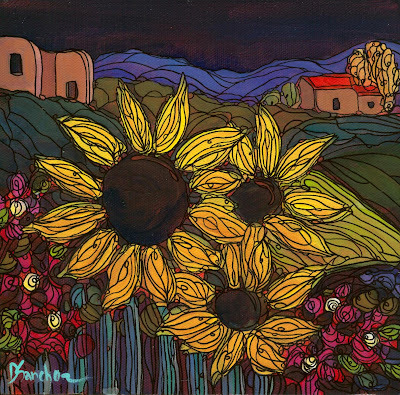 Oh, the sunflowers. I haven't painted them for awhile and I miss them. 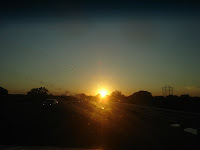 In my 150 CHALLANGE (www.150challenge.blogspot.com), I have several varieties on my list of subjects. 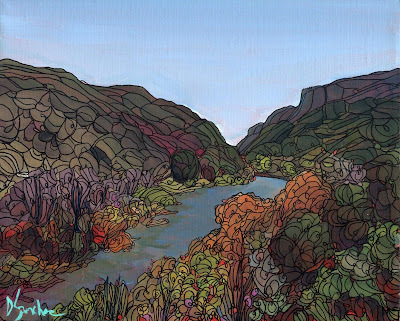 I want to paint a big single, a duet, a trio, five (above), and seven. 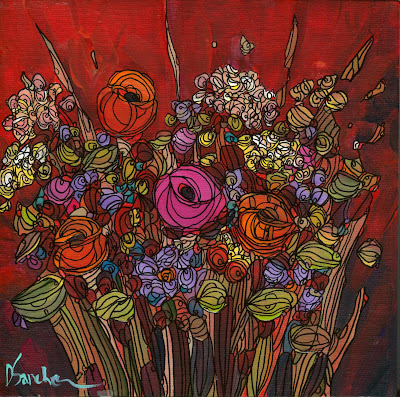 I also want to paint some reds, a still life and a big sunflower bouquet. I may also try a huge close-up of the seeds, a la Georgia O'Keefe. Anyway, this is the first of several. Purchase information is below. The painting above is just a simple, pretty spring bouquet of sunflowers, cosmos, roses, asters, and a few little others sprinkled throughout. It was so much fun to paint, now I want to paint a larger canvas too! Purchase information is below. Today officially begins my year. I meditated this morning and just got back from the gym (yes, me!). I cleaned my studio yesterday and organized my supplies for the 150 CHALLENGE - which starts today, by the way. 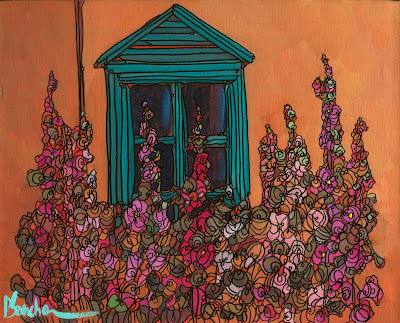 I have a countdown list, so I am starting tonight with painting #150. I will also post a daily painting tonight. It snowed yesterday but the sun just came out which makes me SO happy. My very first painting - a watercolor we raffled off at a homeschooling conference. 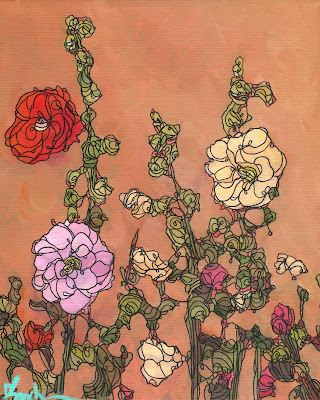 My hollyhock painting is sold. I may try another one just like it tonight. I also have someone asking for a painting that has water in it, that's an idea. 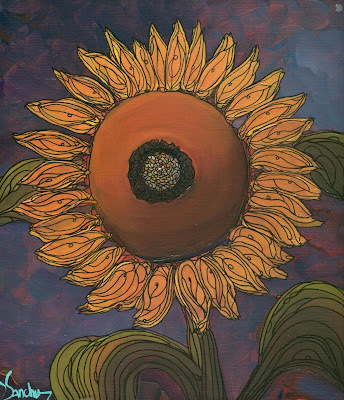 I'm also getting the urge to paint sunflowers. It's kind of nice at the beginning of the year - to just think of all the possibilities ahead. I'm making a list for the 150 Challenge of everything I want to paint. If you have any ideas, send them to me. 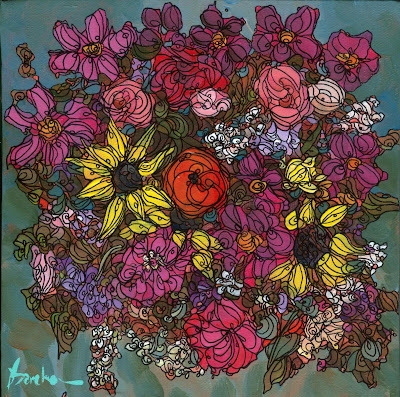 I am also going to start a 48"x60" big floral color field painting for my gallery. I want to incorporate lots of paint drips into the final piece. I will try to take some videos of that when I start working on it. 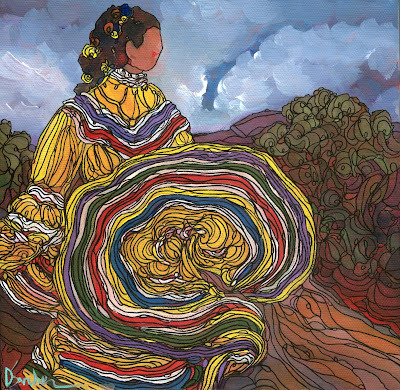 sunflowers, calla lillies, adobes, churches, acequias, mountain florals, Canyon Women, horses, sheep, chickens, hollyhocks, old windows and doors, Madrid, Placitas, Santa Fe, Taos, Corrales, mountain views, chile fields, dancers, mariachis, parades, cloudscapes, blanketflowers, sunsets, poppies, iris, old trucks, adobe walls, roses, grapes, wine and stemware, angels, crosses, descancos, gates, bouquets, bouquets on red, Galisteo, mailboxes, wildflower meadows, pears, flower pots, still life, aspen trees, tulips, Jemez, geraniums, Sandia mountains, choke cherry blossoms, little farms, coneflowers, and maybe an interior or two. Well, it's late but I finished it! I decided on a more intimate version of the photo below and brought the flowers a little closer to the viewer's eye. I think it makes for a nicer painting. 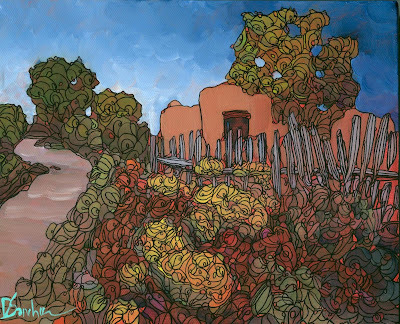 You can almost see the red/burnt sienna ground I used underneath the adobe wall color. I also took down my Christmas tree, cleaned my closet, and picked up some fruit tree prunings. Tomorrow it's my studio clean up time and a little visiting! Enjoy! Did everyone survive the new year? I STILL have to sit down and write out my goals and predictions. It was so warm here yesterday that we got our little fruit trees pruned - an apple, two nectarines, two cherries, a peach and an apricot. We found a humminhbird's nest in the apricot and put it back when we were done. Maybe the hummers will return to it this spring. The photo above will be my daily painting for tonight. I took this up in Taos a few months ago. I love how the orangey-red hollyhock is all by it's lonesome at the top. I hope this will be a wonderful and creative year for all of us. What are YOU doing today? Do YOU have goals or resolutions that you would like to see happen this year? Email them to me - you will inspire me and we can look back at them on a regular basis to see how we're all doing. I'll post my resolutions tonight. Enjoy your day! !